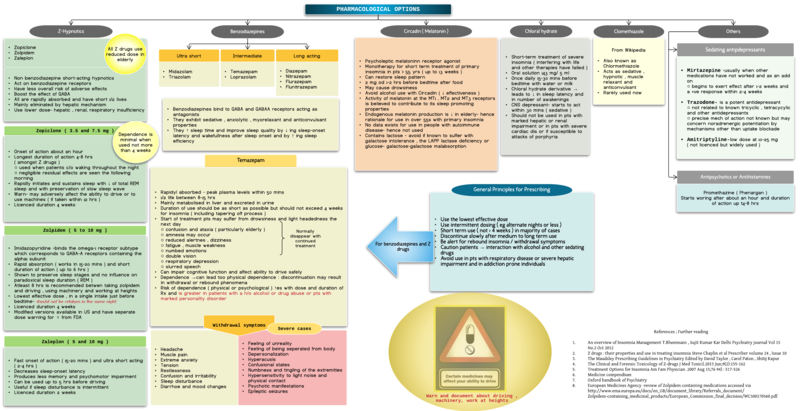 This chart on A4Medicine is an overview of the commonly used pharmacological agents in the management of insomnia in the UK. Z-drugs particularly the commonly used Zopiclone and Zolpidem are discussed in greater details. Temazepam is another commonly used medication and reader will find the information practical and clinically useful in prescribing this medication. The onset of action and duration of the drugs are mentioned which can help clinicians give appropriate advice. Melatonin ( circadian ) licensed for use up to 13 weeks- that is the time it should take to restore the sleep pattern is discussed. Mechanism of action of all the agents is described briefly.